It calms me down just thinking about Peppermint! Peppermint was the first essential oil I ever used and what sold me on signing up for the Premium Starter Kit with Young Living. Last June, I offered to help out with Wild Week (VBS for 5th and 6th graders) at our church. About day 3 I was hitting the VBS slump and was getting a headache. A friend had just purchased a Premium Starter Kit (PSK) and had it with her. She also had a reference book with her. I the oils and started smelling them and opened the reference book to headaches. Put a drop in my hand, rubbed it on my temples and then cupped my hands over my nose and took a deep breath. Within 5 minutes my headache was gone and did not return. I also had enough energy to make through the rest of the day with 5th and 6th graders. MIRACLE! Also in June, my 8 year old son was playing baseball in the AAYBA World Series and he over heated. We had seen other kids that week overheat and leave in an ambulance or have to leave the field on the medic golf cart. So, naturally I was worried to say the least when it was my own son. 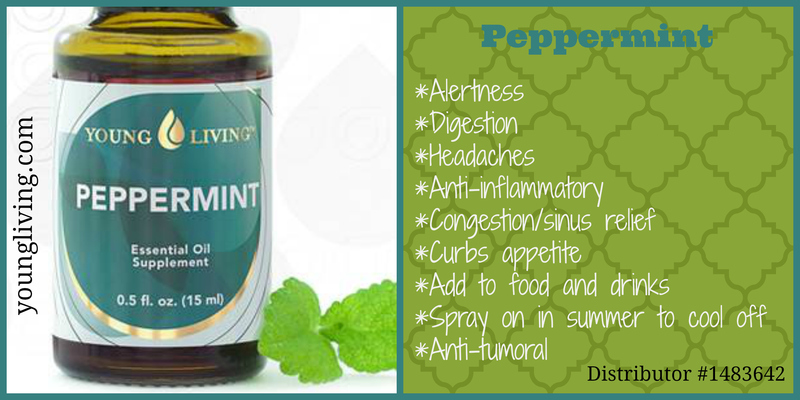 A friend came running over with her Peppermint oil and told me to put a few drops on the back of his neck and his temples. Within 10 minutes his color was back and he was ready to play again. The medics were all so pleased at his recovery. After these 2 experiences I knew I needed my own YL PSK and Reference book. It had been a rough school year for our son due to being diagnosed with Migraines, Asthma…struggling with Bronchitis and many other things and every breathing treatment made his lymph nodes in his armpits swell and it was very painful. We needed to try a natural alternative for his health. I am proud to report that it has been almost a year and he only missed 1 day of school and that is because we went on a fabulous vacation to Disney World. He is reminded when anyone else is sick that God has blessed him with a very healthy year. He is also thankful for YL Peppermint and RC (another post). Any time he feels a headache symptom or even the slightest cough he will ask me for oils. If you are interested in trying Peppermint or getting your own Young Living Premium Starter Kit, let me know.